WALKING WITH POPE FRANCIS... The Catholic Church and people of good will around the world have begun a journey walking with Pope Francis. Holding the papal office, a position of immense power, the Pope, in his inaugural address declared to the world. “True power is service.” He comes from “almost the end of the world” as he also said in his first greeting. That “end of the world” could well mean his option for and commitment to the poor. The passion for the poor is what catapults him to papacy and it will continue to lead Church, a Church close to people and, above all, to the poor and afflicted. Who is Jorge Bergoglio? This book presents a glimpse into his life: Looking at the first few days he has been in office and at his background in Argentina as Archbishop of Buenos Aires. 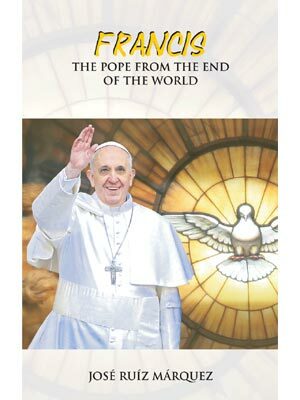 With short historical information about his early and formative years and an interview with a good friend of Pope Francis, the book sheds light into the making of his extraordinary personality. JOSÉ RUÍZ MÁRQUES, lecturer, consultant and professor in Bible and theology. Fr. Ruíz Márquez is a Claretian Missionary, who graduated at the Gregorian University in Rome and the Catholic University of Paris. He exercised his ministry serving the Congregation in Equatorial Guinea and D. C. Congo in Africa, in Korea and presently teaching in the Philippines.